I need it to survive, I need it like a fish needs water and a human needs air…. The monarch butterfly is an iconic one; when the average person thinks of a butterfly- they are picturing that white spotted; orange and black butterfly. Its orange wings illuminate against the green leaves of plants and trees in the summer time. Its easily recognizable and is found in Mexico, Canada and the United States. Now that you are picturing that bright orange, white and black little beauty- let me tell you this…it is in decline. Reproduction of monarchs relies on milkweed plants- they do not lay their eggs on anything but milkweed! Crazy I know, but TRUTH! Milkweed is like a little hotel for monarch butterflies. 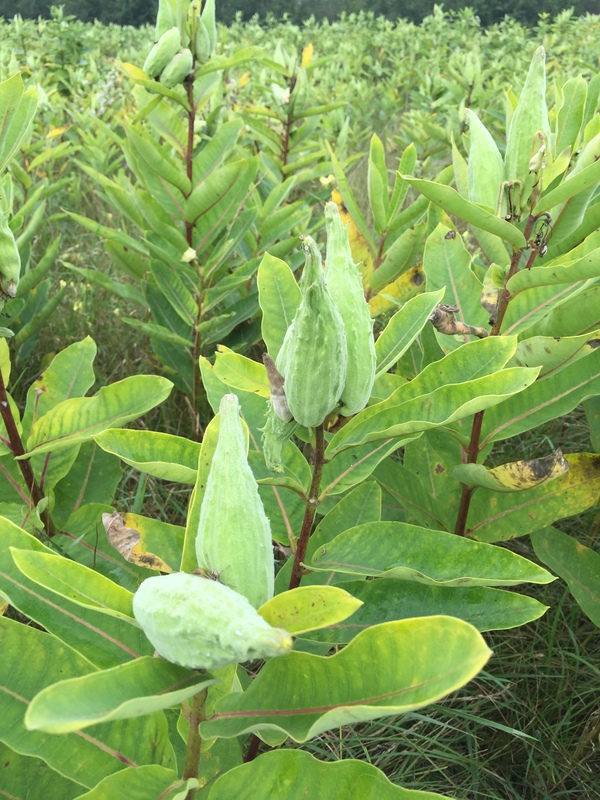 In the spring time, monarchs lay their eggs on milkweed plants and when they hatch the milkweed leaves becomes food for the larvae. They eat, eat, and eat the leaves of the plant until they are a full blown caterpillar. The monarch caterpillar is also beautifully orange, black and white. When the caterpillar is fully grown it finds a safe place to form a chrysalis to become a beautiful butterfly- just like I learned in grade school! Monarch butterflies also require nectar for food- gives them energy to fly and migrate- its their Gatorade! 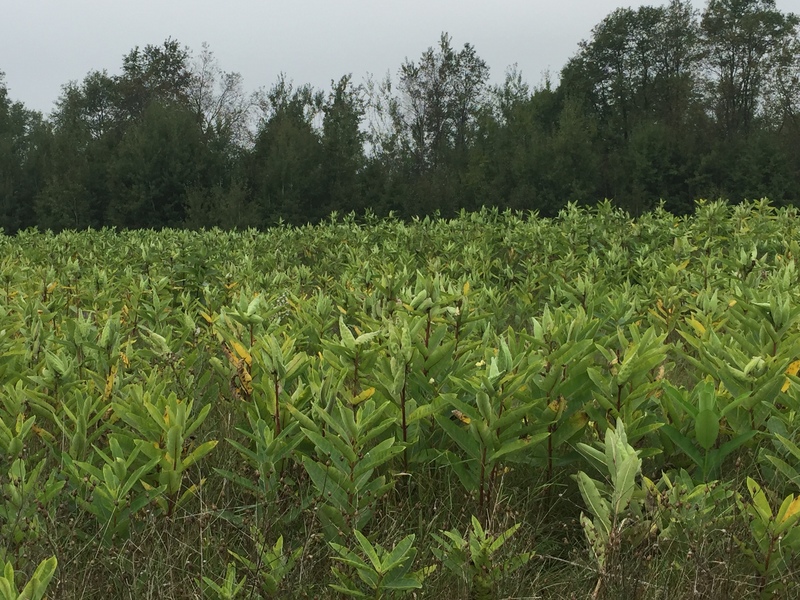 I chose to talk about Monarchs and Milkweed because earlier this week I was out on a site visit doing the typical- hugging trees- I mean checking out oak wilt and other diseases on the property and I ran across on acre sized field of milkweed!! A Monarchs paradise! This summer at the conservation district we have really been focusing on planting native plants for promoting native pollinators. Non-native plants do nothing for our local pollinators; bats, moths, butterflies, birds, bees, beetles and other insects all do their part to pollinate our foods such as fruits, apples, nuts, pumpkins and even chocolate depends on pollinators- so we need to provide those plants for them! Do it for the Chocolate if nothing else convinces you to plant natives!! I fly thousands of miles back to show you my beauty and grace each year- but I cannot do it without a home provided to me with milkweed. Go Native–Plant Milkweed! 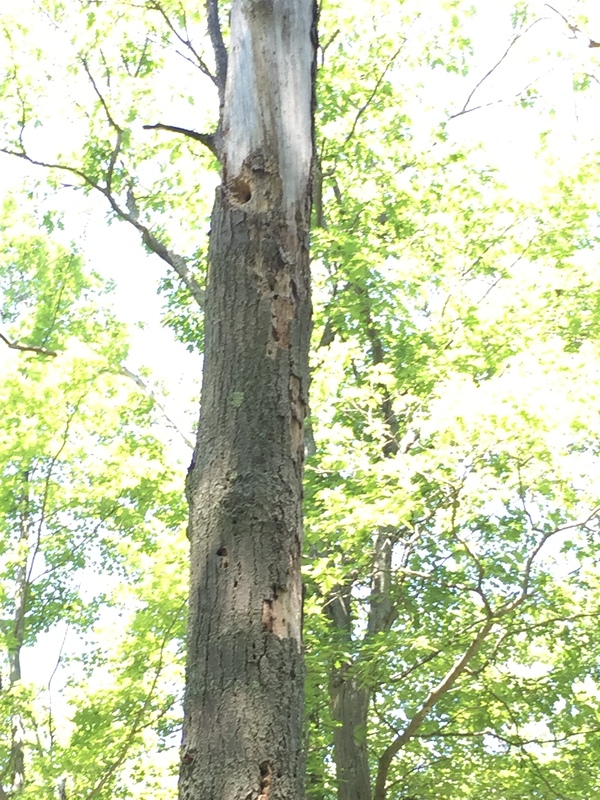 Holes in my trees…most commonly blamed bird woody the woodpecker! Both are birds indeed but both do different damages. I have had a few calls from landowners curious as to how they can keep the woodpeckers away from their beautiful yard trees. I ask them what kind of trees they have as well as the overall health. Sapsuckers enjoy maples and oaks, woodpeckers do not discriminate with species so much they just enjoy the dying or dead trees where the larvae and other bugs are. 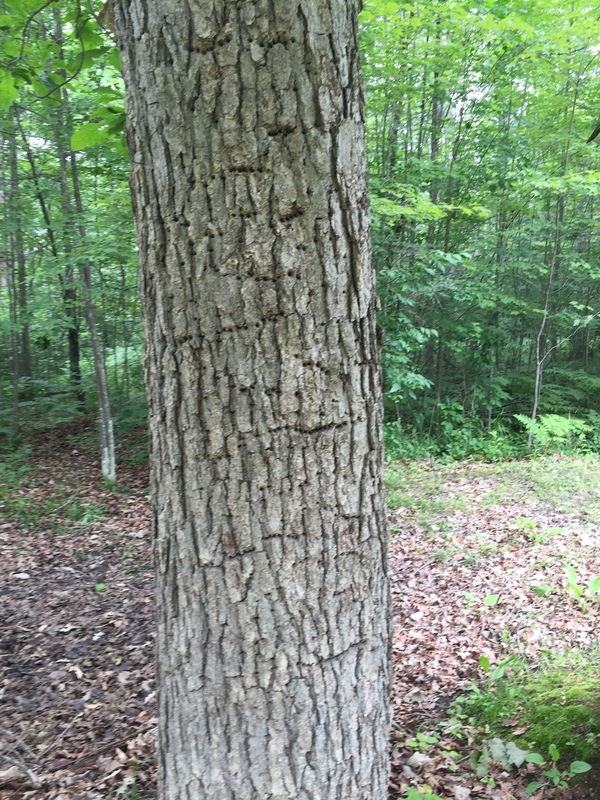 So if the tree is a maple or an oak and in good health its more likely to be a sapsucker. If the tree is already showing signs of decay and dieback it could be our friend woody the woodpecker. If It is still hard for me to guess over the phone I ask the one sure fire question. Are they tiny holes in horizontal rows? If I get a yes its sappy the sapsucker and if no they are random large holes its woodpecker damage. 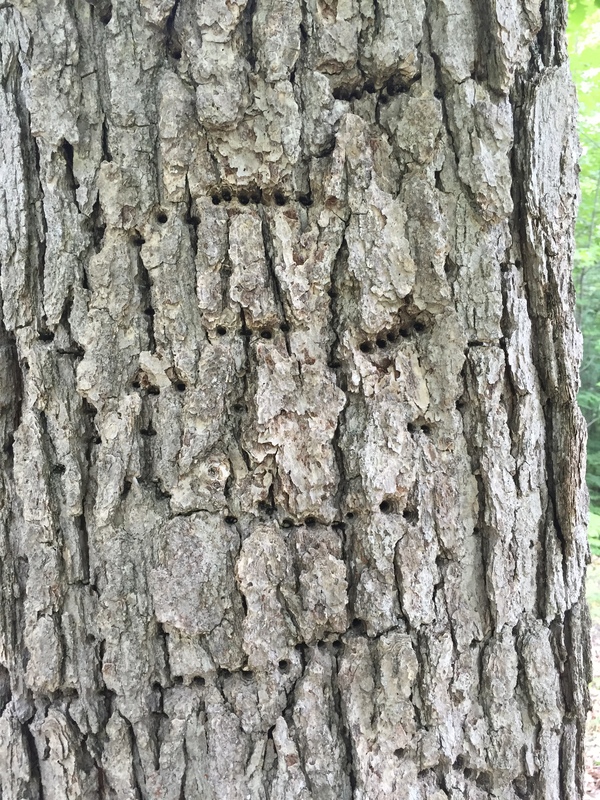 Sapsuckers (Yellow-Bellied Sapsucker in Michigan) form lots of small holes in horizontal lines. This allows for sap to flow out which they feed on. Other animals benefit from this and feed on the sap as well. Sapsuckers also feed on insects and suet. So I guess if you want to protect your trees hang bunches and bunches of suet cakes in the tree! 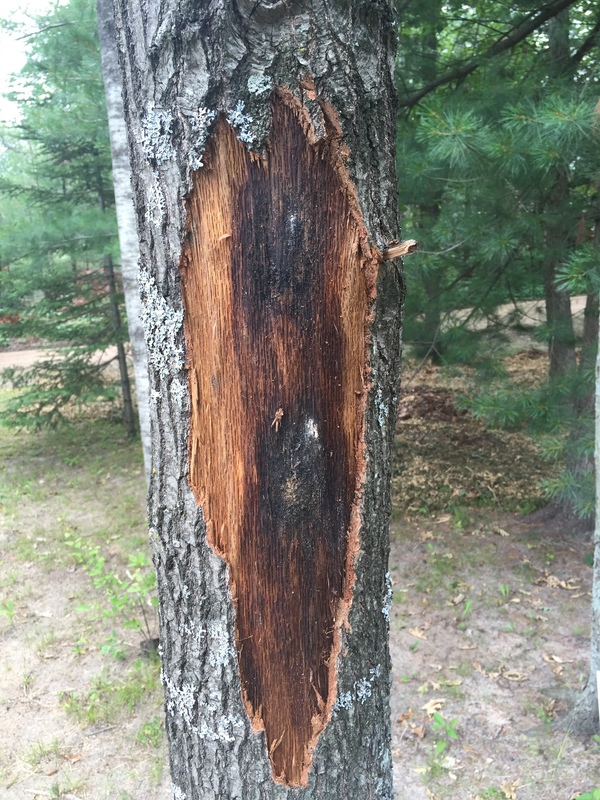 Extensive sapsucker damage will eventually kill the tree if it is not strong. It is cutting off the flow of water and nutrients in the cambium layer. Woodpeckers are considered the 3rd sign of a trees death. They normally go after weak trees that are already dying. They are in search for all the insects and larvae burrowing around under the bark of trees. They are looking for beetles, spiders, centipedes “Nom Nom Nom”! Many woodpeckers help control the populations of invasive or other pests that are destructive to the forest. Woodpeckers will also feed on nuts, seeds, and suet. The only way I know of controlling these birds, to keep them from coming back to landowners trees is to put reflective things up in the tree or by the house. Old cds or mirrors hanging in the branches is what I suggest, but its not full- proof. I did have one landowner call back and say she cut up old pop cans; creative. 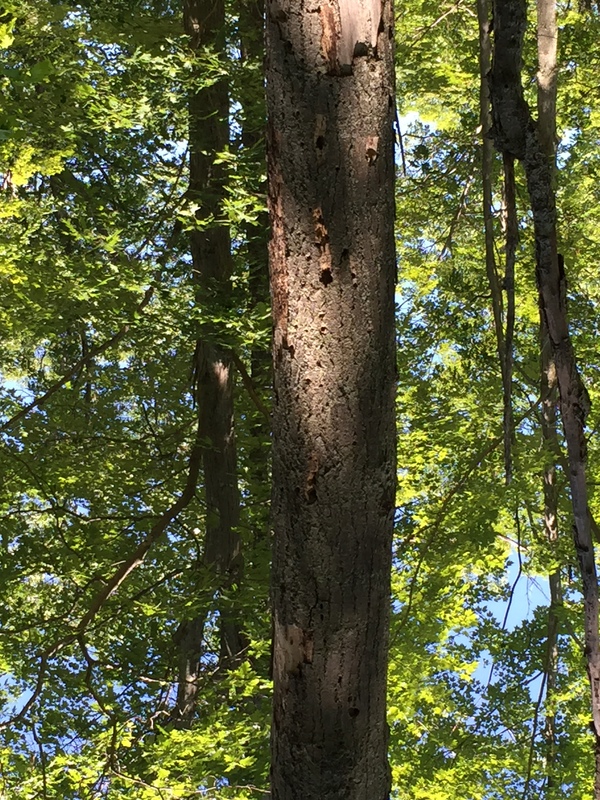 If you see a white butted bird fly away from your tree robin size…chances are you are watching a Yellow-Bellied Sapsucker fly away!!! Back in April I knew I would be doing some outreach for oak wilt and needing to research it more extensively in order to help out a few of my landowners and answer questions. However, I never did expect what has happened. 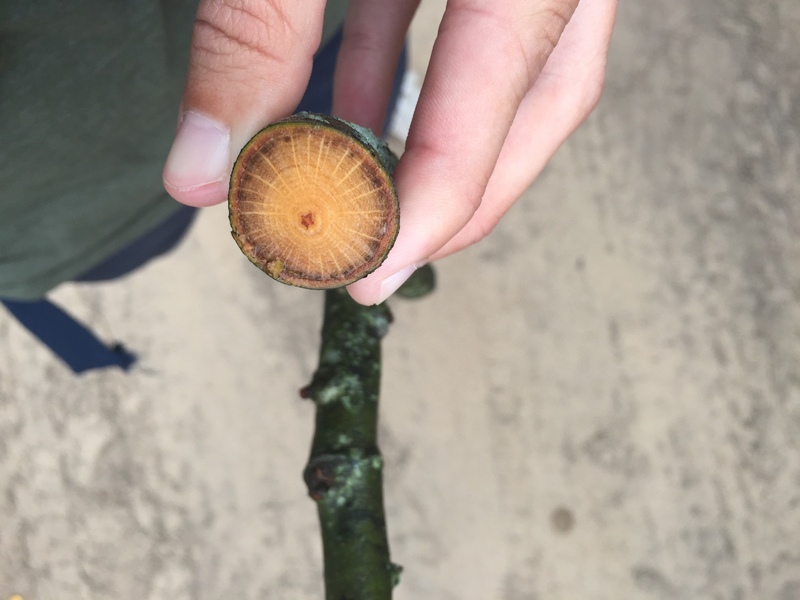 I had written a couple overview articles on oak wilt for the local papers just to get the word out there to stop pruning their oaks, do not injure or cut oaks from the time of April- July 15th. Immediately after the news releases the phone calls and emails came flooding in. All leveled off and I began to settle down for a little bit. Most of those calls were just folks who had trees die last year. Now, when I say a little bit I meant it. Soon after that the newly infected trees started to “flag” show signs of wilting. Oh my goodness, I had no idea what I was in for. 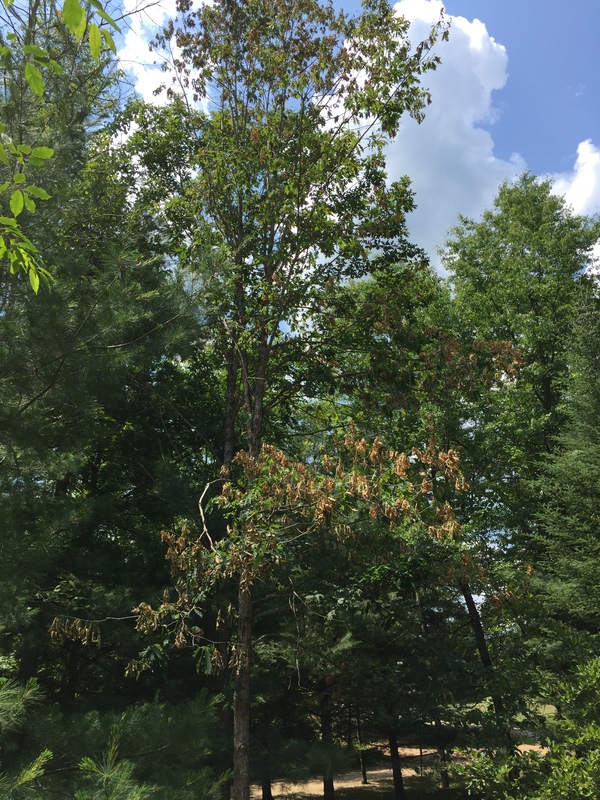 One of my counties is heavily covered with oak wilt, controlling this and stop it from spreading to the surround counties is key- but is it ideal?! Anyways, LOOOONG story short my new job is Oak Wilt! It is widespread, depressing and hard to control. I say depressing because once infected- tree is dead- too many dead beautiful oaks!!!!! A couple weeks ago, I got to enjoy a one on one training with one of the oak wilt guru’s in Michigan. I set up a property where I was pretty sure it was oak wilt and so was he. We showed up at my landowners property- hatches in hand and started banging on the the dead trees. First, we were looking for cracks in the the bark, then would test with the hatchet to see if it was hollow. 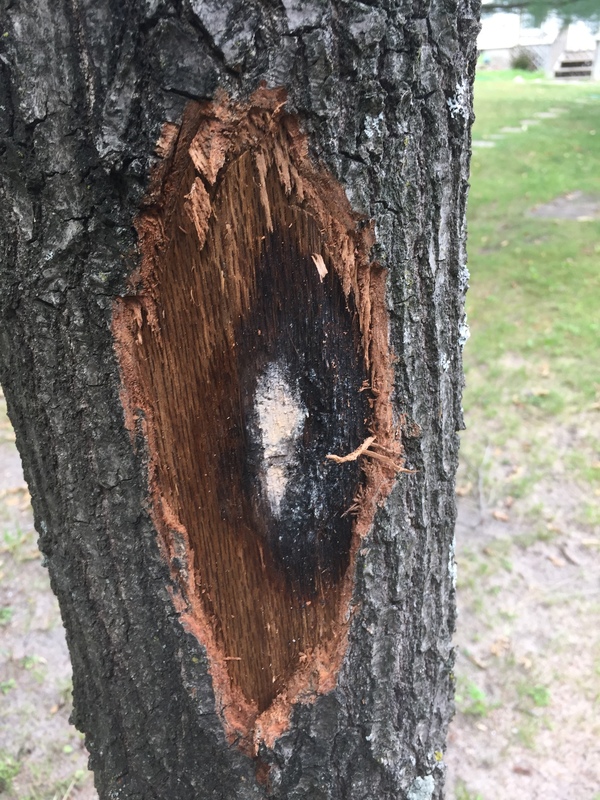 If yes, you start going at the trunk of the tree with the hatchet taking off the bark and revealing this dark football shaped “pressure pad”. The pressure pad forms the following spring after the tree has flagged and kicked the bucket! It often will have a sweet smell attracting the beetles. The pressure pad and its nasty spores are the last fighting chance for the disease to spread! Anyways, back to my experience with the oak wilt guru, enough about pressure pads! After we located the pressure pads, we knew 100% it was oak wilt- that is the sure fire way to diagnose the site as oak wilt. After that, we moved onto looking at a flagging tree. We cut off a branch that had some healthy leaves left as well as some wilted ones. Inside you could see a black ring around outer layer, the cambium. This is the fungus clogging up the water vessels of the branches and trunk. In Michigan the Conservation Districts, DNR, and MSUE are all working together to GPS track and try to fight this or least slow the spread. This tree is “flagging” turning brown from the leaves wilting from lack of water. Black Walnut- Friend or Foe? 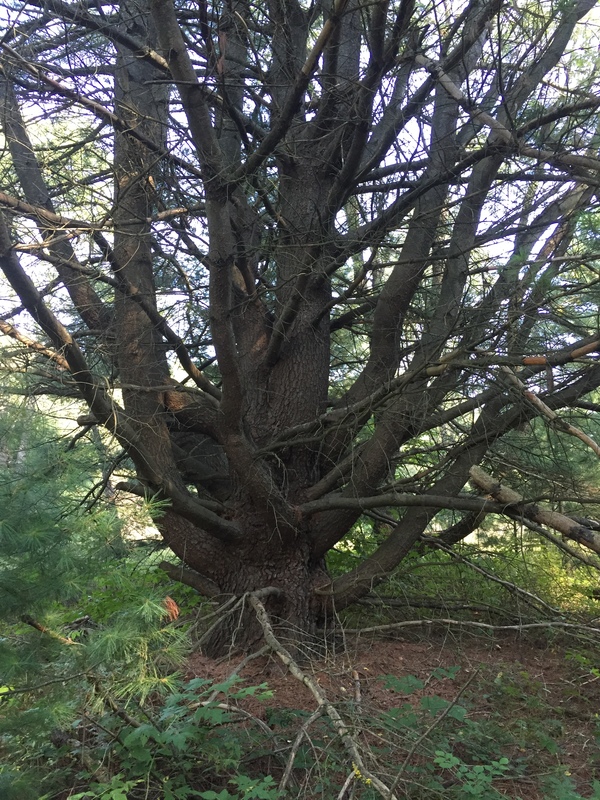 A highly valued tree; but at what cost? When I was a kid, I would always go over to the neighbors yard because they had large trees that we could climb. One of the trees was a black walnut, back then that was all I knew about the tree. I knew it was a walnut tree and that it would drop these big green things and squirrels would hide them for later! Black Walnut, Juglans nigra, is highly valued for its fine grained dark wood, used often for furniture. It is also a great food source for wildlife. 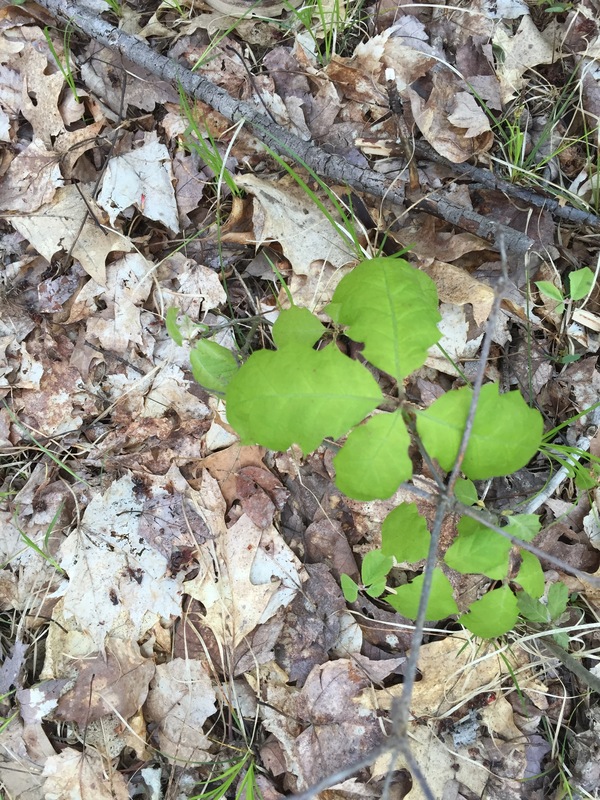 While it may provide beautiful veneer wood it also provides a natural herbicide called juglone. 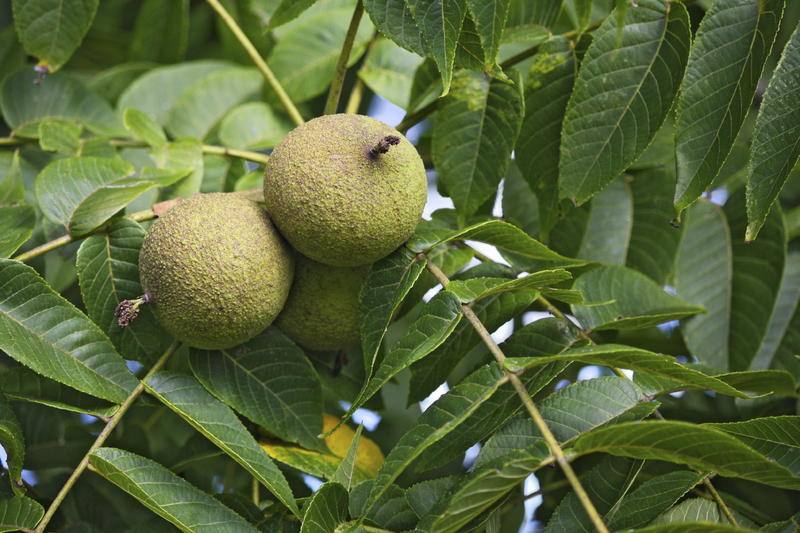 Juglone is found in almost all the tissue parts of a black walnut tree, just in different concentration. The highest concentration can be found in the fruit, the fleshy green layer of the walnut, with 100. Like mentioned, the juglone is a natural herbicide produced by black walnuts so this is where the foe part comes in. It prohibits new growth of certain plants, trees, shrubs, or flowers around it and if it is grown by already established things it can kill them off. I recently went to a site visit where this was the case. The landowner had a hobby farm, where he was growing black walnuts. The trees are doing great however they are now seeing that their plum trees and other surrounding vegetation is dying off. As leaves, fruit, flowers blow off the tree and land on and near other vegetation they secret the toxic juglone. It is also in the roots and trunk so it is leeching into the soil. 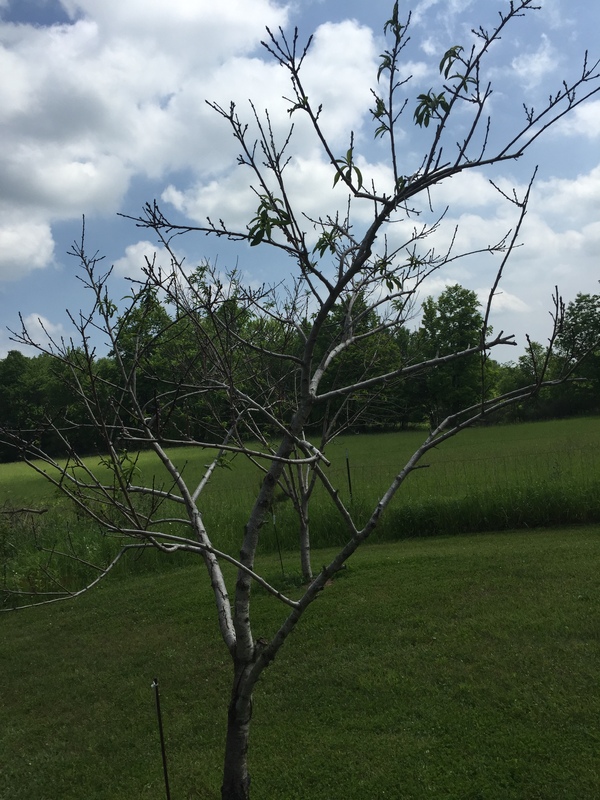 If the tree is cut down and removed the “herbicide” is still in the soils and can take years for it to be gone depending on the drainage of the soil. Now, its not all bad, like I mentioned great food source for wildlife and humans like walnuts and it is a great wood for production, just have to be selective of whats around it. Some plants are tolerant to the juglone and still can be grown. Some examples of tolerant species include, beans, carrots, corn, black-eyed Susan, morning glory, trillium, Eastern redbud, dogwood, poplar, black raspberry, and soybeans. There are several other species tolerant. Most folks do not like black walnut trees because they are messy but now their minds will be blown- messy and toxic! Because of this if they are not out naturally growing in a forest; they are usually use for plantations for nut production or can be a yard tree with selective vegetation around it. Side note: black walnuts are not the only tree that produce juglone- other members of the Juglandaceae also produce it as well as hickory trees. Butternut, English walnut, bitternut hickory, pignut hickory, pecan, shagbark hickory, mockernut hickory are the common names of juglone producers! As the school year ends, I was asked to help out with several elementary schools for the end of the year outdoor events. 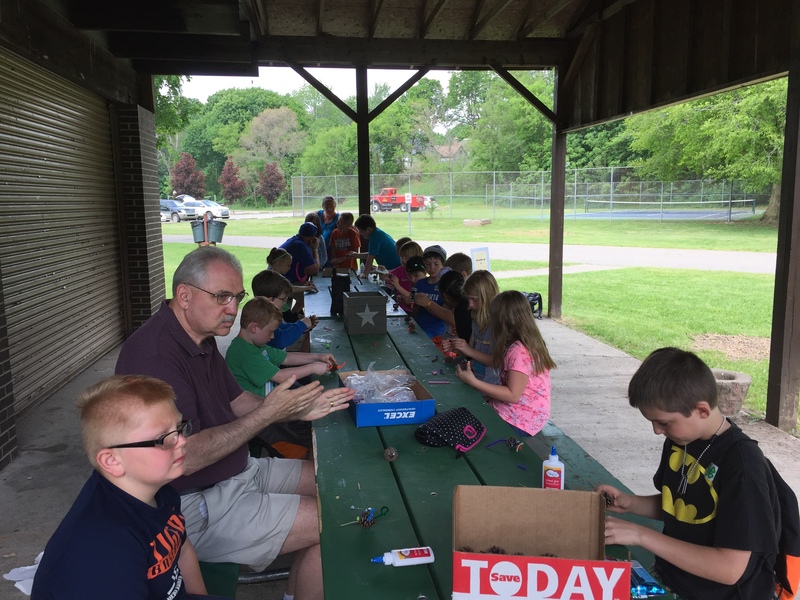 Yesterday, I helped with the third graders at a local school- 150 of them!!! For all you teachers out there, I commend you, one day with them I was exhausted! I have worked with smaller groups of children with 4-H, boy scouts and such but not a group this big. It was great to see the children so excited about trees and conservation, we have to get them excited about the environment at a young age in hopes they continue to grow up with a conservation mindset. I chose the quote at the beginning of this entry because first off Aldo is amazing and secondly because the quote says it all, the children I was with Friday are young in a time where they can not always be “young in the wild”. Times have even changed since I was young. I always spent my days outside in the woods running around and exploring and coming in once it was dark- kids today cannot do that. Which is basically what Aldo Leopold is saying here, he is glad he is not young “today” because it is not the same wild country where kids can go outside and be safe playing enjoying nature like we used to. We have also expanded in a way where children are growing up in more urban environments where the backyard is fenced in with little adventure. Working with the third graders was fun, intimidating, but fun! A lot of little kids starring at you is intimidating!! We talked about conservation, how trees grow, the difference between a deciduous and coniferous trees and then did a fun little recycling project! Every time, I said deciduous tree they looked at me like I was speaking a foreign language! Some of them knew about economics but trees was a foreign language! Yes, economics is important- but trees are life too!! One young boy told me that deciduous trees are the ones that are hollow, another said the difference is their bark! Hopefully, now they know the difference. 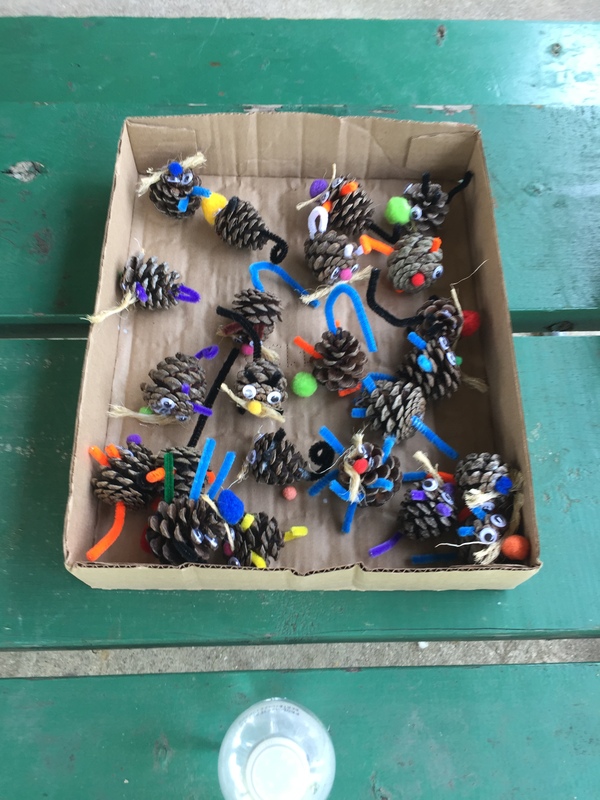 For the recycling project we had some fun, I wanted to keep the kids entertained so we used red pine cones to make little critters! Gave them all a chance to be artsy and crazy while learning about pine cones and enjoying nature in a way that will hopefully stick with them! Twig the Cone Mouse- My example creature. Sitting inside while it is raining outside all day- gets me thinking. Water is some ares of the planet is a commodity we take for granted- here in Michigan we don’t even worry about it because we are surrounded by the Great Lakes- doesn’t get much better than that right?! 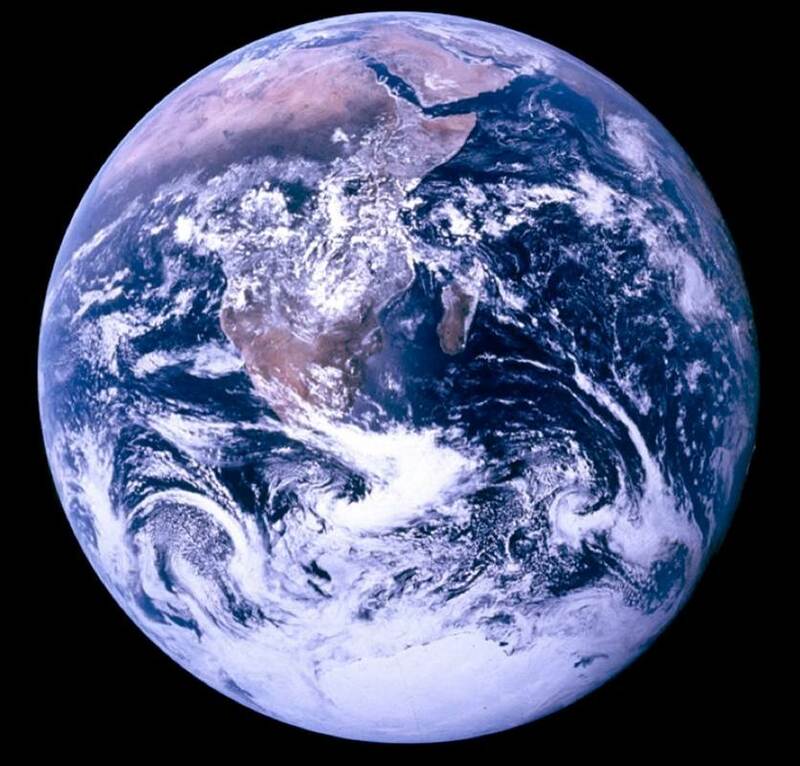 No- just because we are surrounded by freshwater does not mean other parts of the world are struggling for clean water to drink, bathe in, or use for cooking. Look at California- a place kind of like home since it is the US, they are struggling right now and have been for awhile. It is said they only have a year left, maybe less, of water availability. According to water.org “750 million people in other countries lack clean water”. That fact is sickening!! Now, because we do have water at large here in the Midwest, I want to take a moment talk about Rain Barrels!! Yeah a barrel and holds rain- WHO KNEW!? 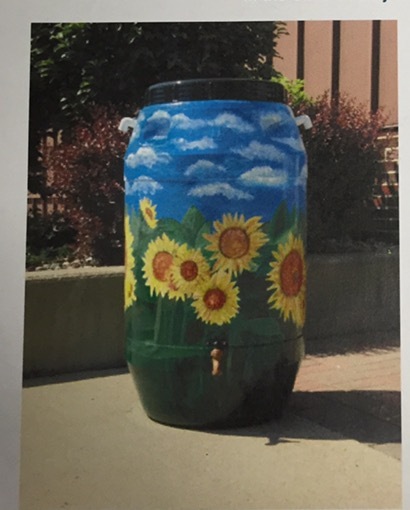 At the conservation district I work for, the administrator received a grant to help folks get all set up with a rain barrel. If set up right, it can reduce the amount of stormwater runoff and save money on watering gardens, plants, and even the grass. Best results the barrel is placed on a sturdy platform underneath a downspout to catch the rain from the roof. A screen can be placed on top of the barrel to keep out bugs and other things that like water! (be sure to clean the screen from time to time–leaves and other things may get on there!!). Also remember to clean the inside at winter time and before the first time you use it again in spring! I heard that one rain barrel owner puts gold fish in theirs to keep it cleaner! Hey whatever works! Rainwater is actually “better” for plants, trees and lawns because it is naturally soft water and free from minerals or chemicals added to tap water- such as chlorine. Its important for us to do our part and conserve where we can and this is an easy way to conserve and reuse water. Also, for you artists out there–fun project alert!! !- Painting the barrel to make it a nice visual piece in the yard! “Not safe for personal or pet consumption! Also- not recommended for veggie or fruit gardens! but great for TREES”! Being a good steward of the land is not about going through it with a fine toothed comb. Whether its one acre or one thousand acres of forest land the key is knowing how to manage it. 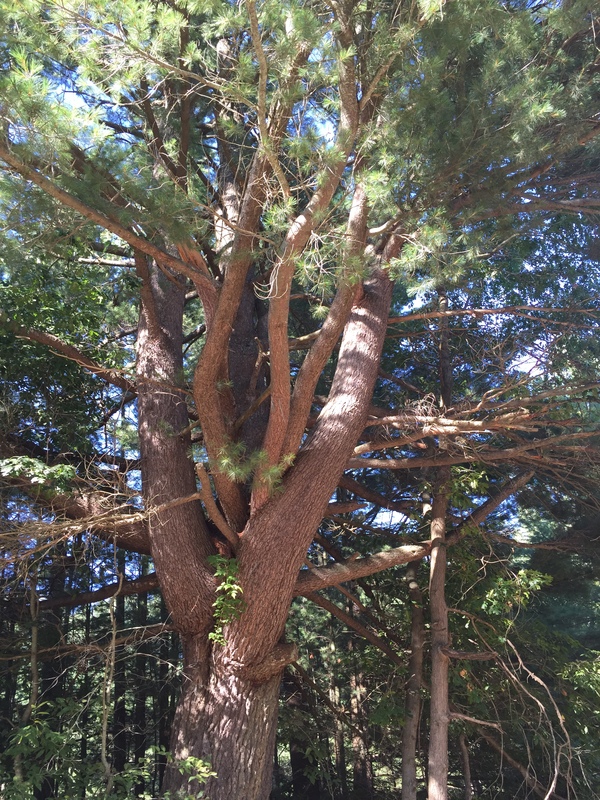 When looking at a forested property I am looking for- diversity in trees, shrubs, and plants and if there are any water features. Once I know what the species composition is and if there are any wetlands, creeks or ponds then I already know a great deal about that forested property. By the species present I can get a rough estimate of the type of soils present (well-drained soils or clay) and by the water feature I know if there is change in elevation and also indicates wet soils; meaning different species will likely be present. Also, by knowing these two things I am able to look at the big picture for best management. 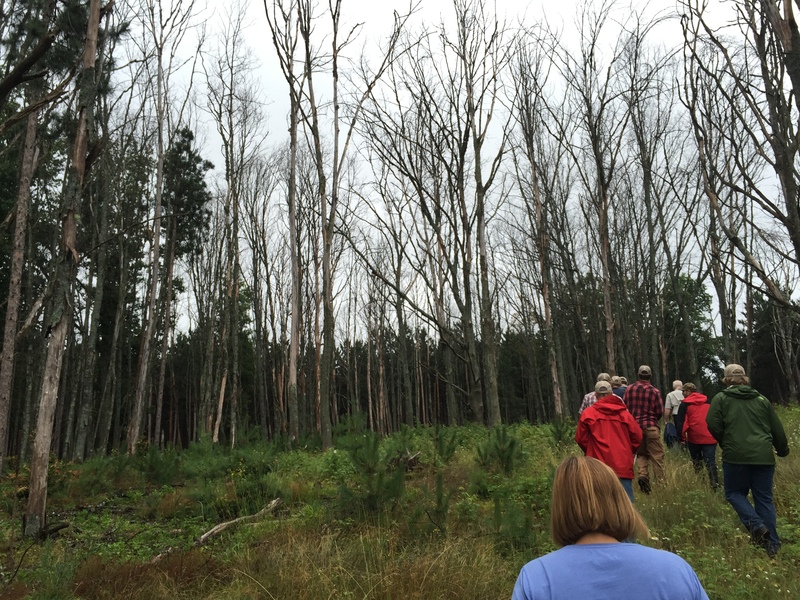 Awhile back I was asked to talk about wildlife habitat while walking through a community forest. At first, I was pumped, “yeah a walk through talking about attracting wildlife”. But as we reached the first place to speak, I froze and not just because it was negative 20 that day but because this forest was so groomed over that it was hard to see that bigger picture. Don’t get me wrong this community forest was beautiful and did attract wildlife with cover and water feature. However, I am used to walking through a forest with snags, fallen trees and limbs, and at least some ground cover. Because this forest is well groomed for the public it does not have all these features due to safety reasoning. Sometime folks get so caught up in trying to keep their property “neat and tidy” they don’t realize its not actually helping promote growth. Without the wildlife habitat spread of seeds decreases, reducing regeneration (not completely but kinda). The opposite of this is just as detrimental, letting a forest just grow, grow, and grow and not manage it at all. Eventually that forest would all just be mature trees- they would grow old, die and little to no regeneration will happen and forest would be lost, or become a huge fire hazard. We need to find that middle ground- where management is happening but not too much where the structure or composition of the forest is compromised. Ahh, the beauty of best management practices!! Now, I could go on and on about this but I feel I have gotten my thoughts across so I will leave with one final thought. 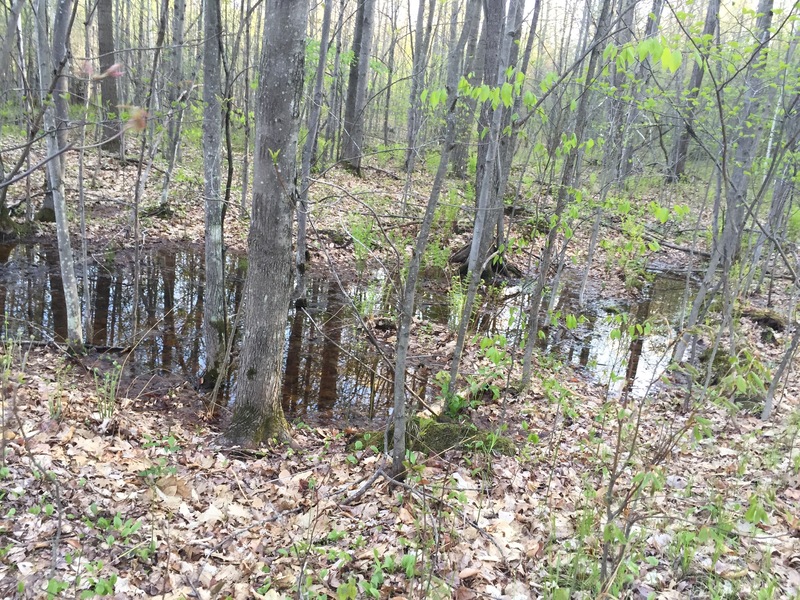 Consult your local forester before doing any major logging, planting, or anything around a wetland; do the research. See the bigger picture, not just whats right in front of you. 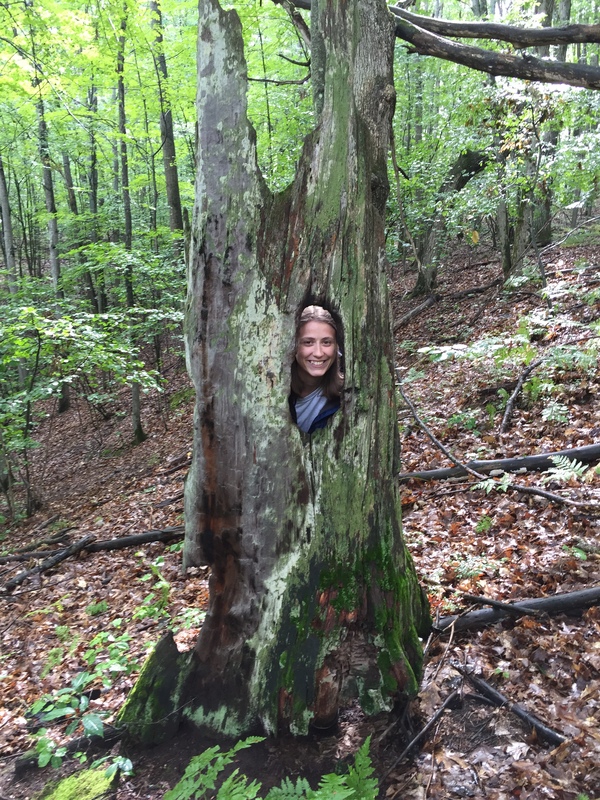 As a forester, I am always thinking future- what can be done now to best manage forests and ecosystems for the future, because “guess what”, we will always be headed towards the future and we want to pave for a “better” future for younger generations. This morning I was talking with a a colleague and he expressed his gratitude for me being of younger generation and being environmentally conscious. Even at my age, I am worried about the younger generation because like my elders, I to am only borrowing this land from generations below me and I want to make sure I pave a better path then generations before me because I have the education and science to make it better. I can not turn my head and say, well the next generation will fix it, I need to ACT NOW. Anyways, off my soap box and to the point of this post. Best Forest Management. 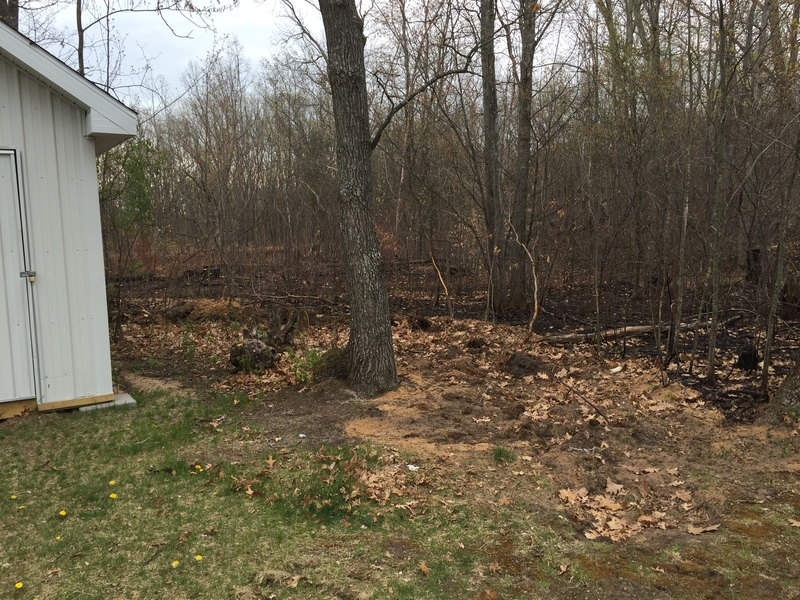 Recently, there was a small forest fire in my backyard and the yards around me. One of my neighbors decided to burn leaves but did not consult Mr. Smokey first! If they had asked Smokey the Bear prior they would have know it was way to dry and the winds would blow the warm coals and catch fire. So a fire broke out, affected 5 property owners, my property included. 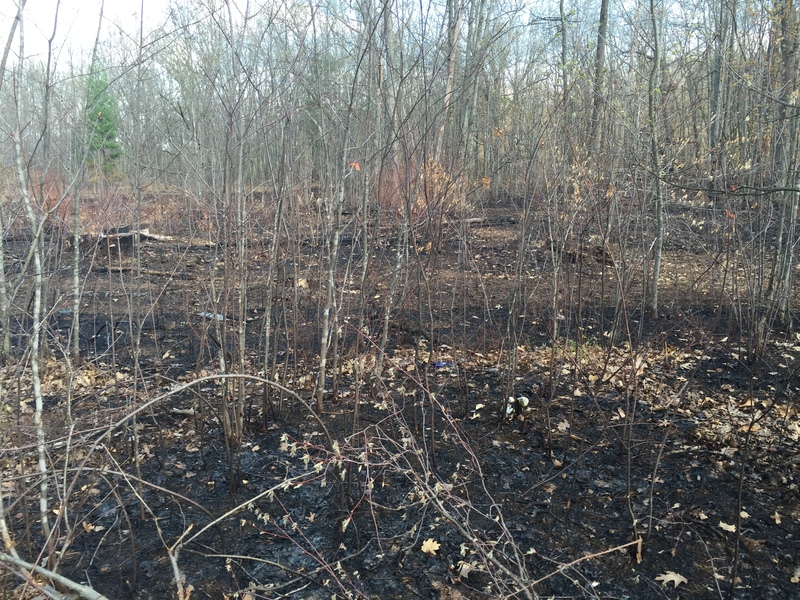 No building damages caused but the ground of the woodlot sitting between us all had been burned. This type of fire is called a cool fire or surface fire, it was low burning and did not affect the canopy. Although, this fire was not a prescribed fire it still has its benefits. 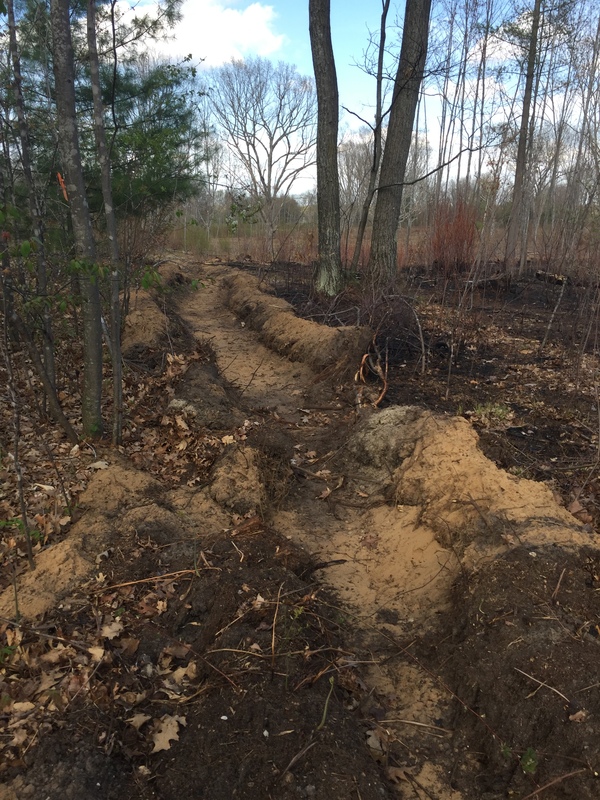 I know some of the landowners affected are not happy, but I tried explaining to them that its actually “good” and since they did not lose any mature trees they will see in the near future that it has benefited them. Forest fires have been used since forever because of all their benefits. 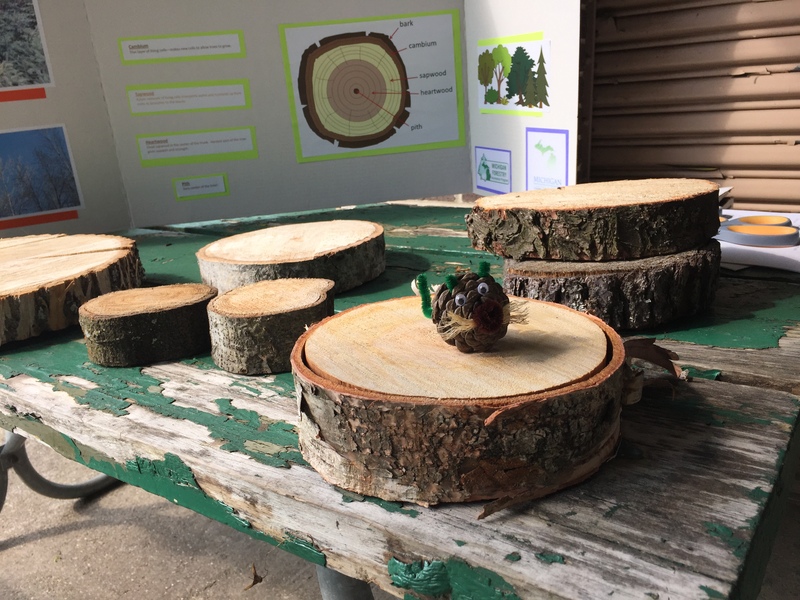 Fires can minimize the spread of disease and insects, it can remove the presence of invasive species that are not used to fire, it can improve habitat, and promotes the growth of native trees, shrubs and wildflowers! The key here is native…fire helps bring back native species while burning out the non-natives and invasive species. Some species require fire to regenerate! Serotinous cones such as the jack pine need fire to open up the cone and release the seeds. Fire is healthy when done correctly. Although this was not a prescribed fire, I believe it will benefit the area burned in a positive way. But lesson learned to neighbors–consult Smokey Bear and do not burn leaves when its dry as dry out! 3ft from back end of my shed!! 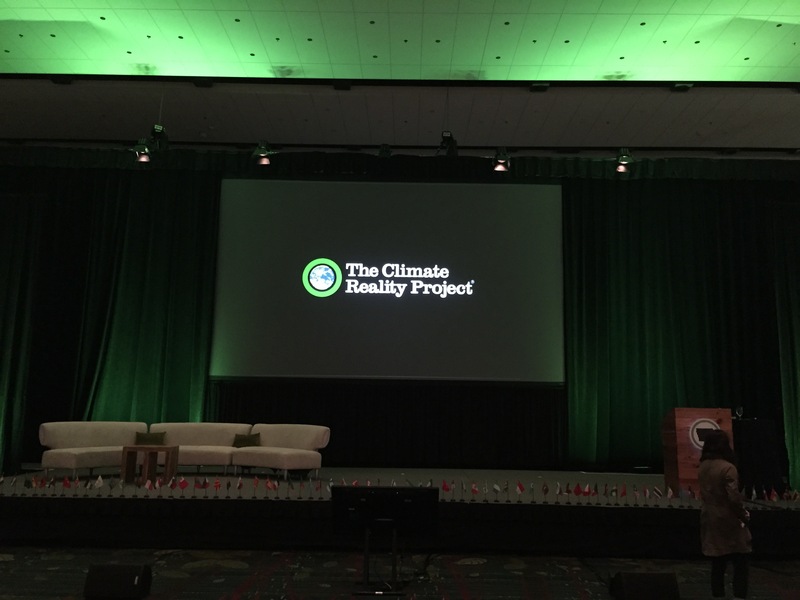 Mayor in TX: “I am going 100% renewable, but I am polar opposite of Al Gore”. Al Gore: “Hey man, that works for me”! This quote was quite funny, regardless if you like Al Gore or not Climate Change is real, renewable energy is becoming cheaper, and we need to do something about it before all is irreversible. This Mayor is entitled to his opinion and just because he does not like Al Gore it does not matter because by him still going 100% renewable is the step everyone needs to take. I am sure I will speak to folks who do not like me- but because the science, the facts, the reality IS real does not mean they will not change! The third day, bittersweet. I was filled with empowerment and knowledge but sad to be taken out of my safe bubble. Last night, at the board meeting I was asked what was one thing I found most beneficial with this training. I responded with it was my safe place. 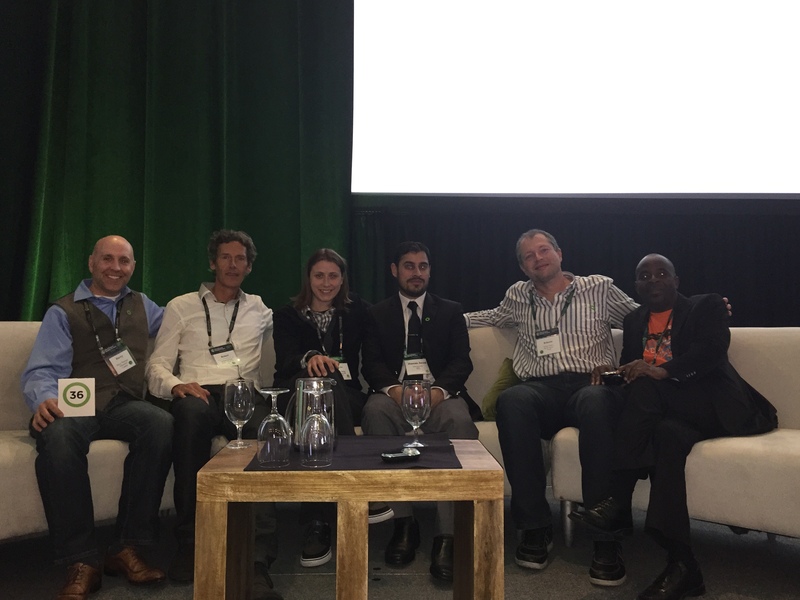 I was given the opportunity to meet folks around the world and be in an environment to get the education, training, and empowerment to fight Climate Change. Climate change in my area is still a taboo statement, so being able to be surround by folks with the same passion was one of the most beneficial things for me. The third day was geared towards using the knowledge we gained and present with the most impact. One of the sessions was all about words, body language and tone. According to The Truman Security Project words count for 7%, body language 55% and tone counts for 38% of the presentation. Basically, no one hears the content of the presentation unless all other things are in line. Another key point I took from this presentation was to identify shared values, when talking about Climate Change it can be difficult but for me personally I can connect “My Story” with folks by talking about trees. 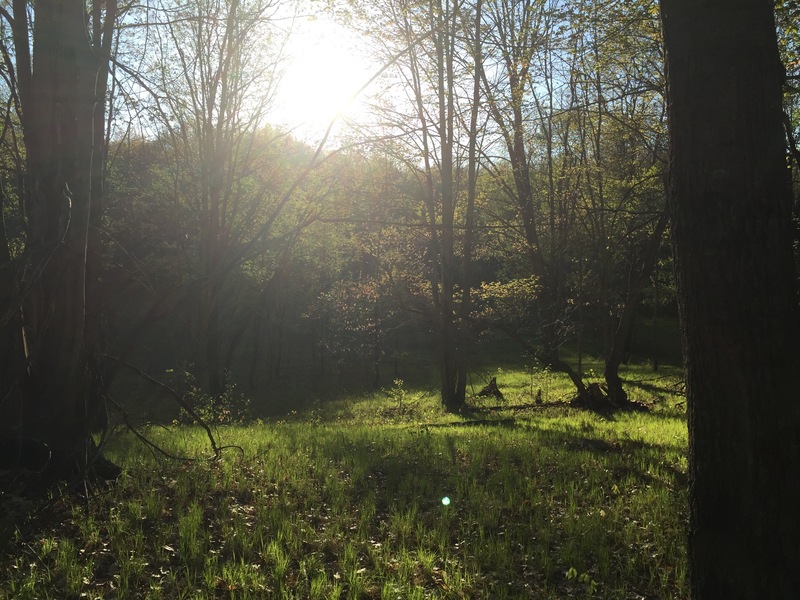 Since it is what I do, I know my landowners share the value of wanting to preserve their forests so that is my main hook to keep my audience engaged. 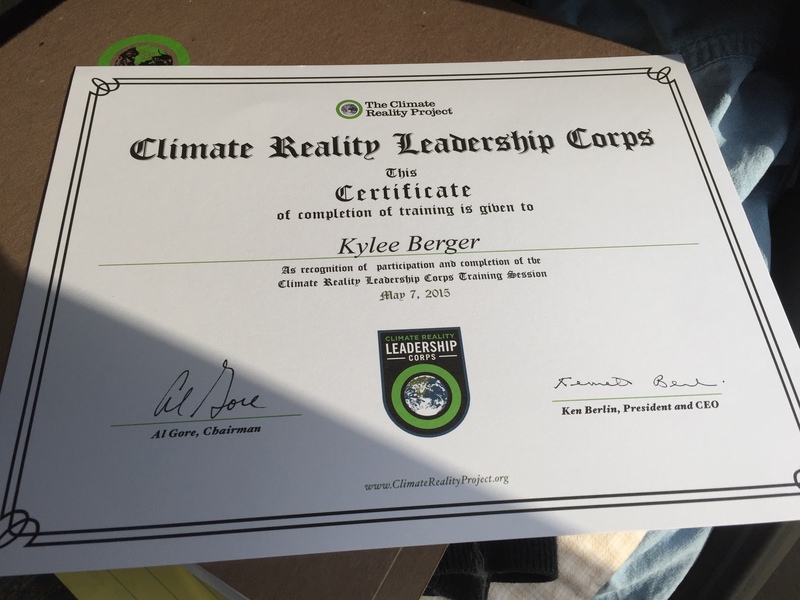 It is now time for me to take what I learned and find my path to Climate Reality and get the message out there! Even if I reach one person at a time- that one will tell another and it will spiral. We have to come together and make a change. This is the future of humanity- so wake up! Oh, and I survived the three days…no flannel challenge!